Unveiled: Raven Daughter, Book One is a young adult fantasy novel written by A.D. Trosper. Jo Collins and her sister, Victoria, sat on either side of their mother's hospital bed, each holding her hand. They knew she was dying, and they were determined to be there for her every step of the way. The two young women had devoted their lives to caring for her as she battled an aggressive cancer for the second and final time. Losing her mom would be especially hard for Jo, who had grown up feeling isolated, apart, different from just about everybody but her mom. Victoria was more of a golden child, tall, blond, lovely and popular, while the shorter, dark-haired Jo was a loner who kept all her emotions securely under control. As the hours passed, Jo watched the raindrops slide slowly down the hospital window until finally, with no fanfare, her mother passed. Victoria dissolved into grief while Jo stayed adamantly in control, refusing to give in to the same grief that threatened to overwhelm her. They were both stunned when they witnessed two strangers in long black cloaks suddenly appear in the room, and their mother, albeit a shadow of the woman lying so still on the bed, standing next to them. The two strangers were even more startled that Jo and Victoria could actually see them. The man said that they would have to be speaking soon, but not here and now. Before they left, Jo's mom reached for her hand and gazed into her eyes one last time, her eyes speaking the love she had always felt for her daughter. The two bereaved young women went home to a house that felt unutterably empty, and Jo began to consider what she should do with her life now that her mom was gone. But things weren't that simple. A.D. Trosper's young adult fantasy novel, Unveiled: Raven Daughter, Book One, is a fast-paced and exciting other-worldly tale about the midtween, the strange parallel world the two sisters find themselves in after their mother dies. Trosper's fantasy world is filled with demon-born beings and their counterparts, humans with angelic blood, but Jo and her sister are special, even in this rarefied company. Jo Collins is a grand character, stalwart, resilient, and prone to snarky, sarcastic remarks even as she gallantly represses any emotional response to the chaos without and within her. Her need to belong, to feel a part of something, seems at first to be resolved as she becomes a reaper and is paired off with that most rare of all things in Jo's world, a best friend, and her own group of like-minded companions. There's plenty of romantic tension in the form of the brooding and angry Caius, he of the golden eyes and magnificent stature. While the offspring of an Arch-demon is one to be feared by anyone with angelic ancestry, Jo is inexplicably drawn to him. This original and action-packed fantasy draws on mythology and the Christian concepts of heaven and hell to provide an intriguing contrast between good and evil and the many shades of gray found in between. Fans of action and adventure will especially enjoy Jo's Yukon quest, as well as the epic battles that take place throughout this book. 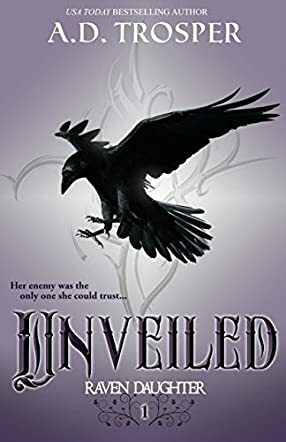 Unveiled: Raven Daughter, Book One is highly recommended.